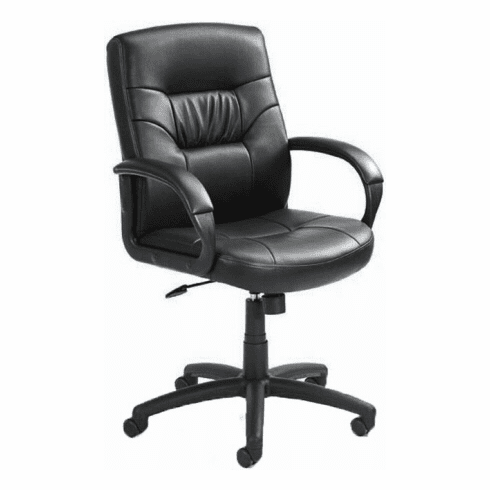 This leatherplus desk chair from Boss Office Products features leatherplus upholstery. Leatherplus is genuine leather that is polyurethane infused for added durability and softness. Other features include thickly padded, foam filled seat and backrest cushions, passive ergonomic seating with built in lumbar support, padded armrests covered in caressoft upholstery, 360-degree swivel, pneumatic seat height adjustment, tilt with tilt lock and tilt tension adjustment and a heavy duty five star nylon base with dual wheel hooded casters. Optional knee-tilt mechanism upgrade is available for a minimal charge. Chrome base upgrade also available. Matching four post leg or sled base leather guest chair also available. This chair meets or exceeds ANSI/BIFMA standards. Dimensions: Seat Size: 21"W x 19"D. Arm Height: 26.5" -30"H. Seat Height Adjustment: 20 -23.5"H. Overall: 39.5 -43"H x 27"W x 28.5"D. Six year limited warranty from Boss. This chair normally ships within 2-3 business days from either our CA or GA warehouse.